As some of you know my husband and I have had a really good week. Mid January in Wisconsin can be pretty quiet and low key. It is a time to stay inside to keep warm and snack too much. I always gain weight in the winter. It is easy to hibernate, but it isn't the best thing to do. That is why we like to take drives around the country side in search of winter scenes and wildlife. The eagles and winter birds are active this time of year. They are easy to see because the leaves are off the trees, and the birds are more visible because they have to work a little harder to get food. We heard eagles were hanging out at a nearby lake that hadn't frozen yet. On one of our drives, we discovered where some eagles were spending time. Two separate days we saw this fellow watching patiently for food. As Spring approaches we see more eagles on our property but there haven't been many so far. We also saw a couple young eagles waiting in the trees looking for their next meal. The young eagles don't have the white head or tail feathers yet. That happens when the eagle is about three years old. Then the icing on the cake happened. We saw a bird that we never thought we would see. I told my daughter and she said "this is the big year". I said "yes, I guess so". She told me she was referring to a movie she watched with Steve Martin, Jack Black and Owen Wilson. 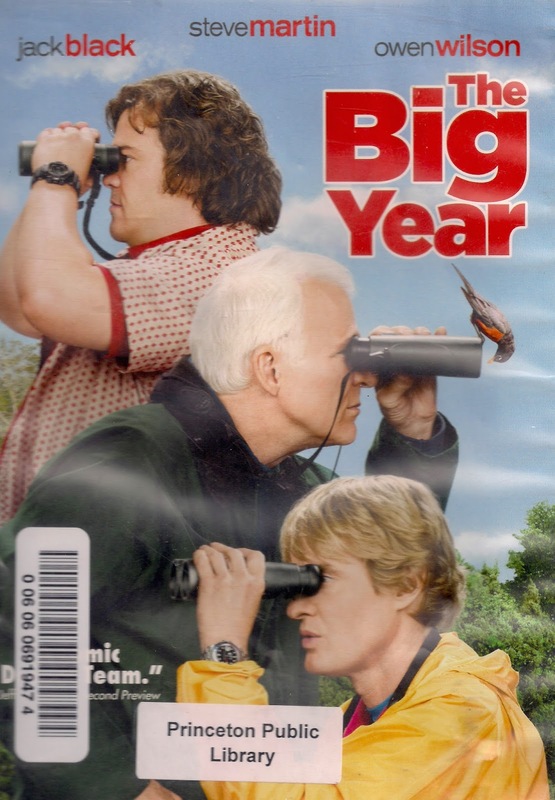 It was about a year long competition to see who can spot the most birds. The movie was called The Big Year. That is what she was referring to. I hadn't seen it or even heard of it, so I looked on the library website. The movie was available for check out and so we did. It is a cute little story. I am a terrible movie viewer. I can't concentrate enough to keep track of complicated story lines and a lot of characters. This movie is simple with a good message about what is important in life. 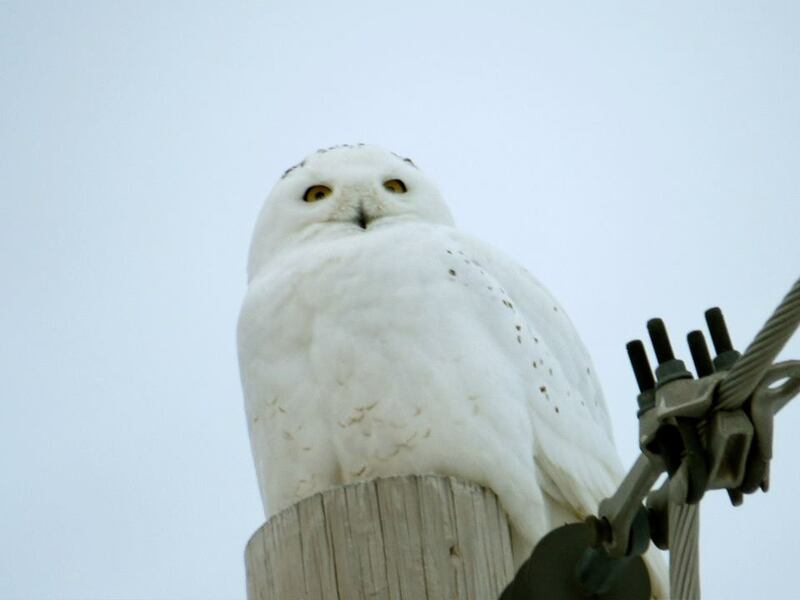 The elusive bird in the story is the Snowy Owl. They saw hundreds of different birds but the most sought after bird was the owl. This week my husband and I saw two. I thought it was the same owl on two separate days, but it turns out there are two separate owls in the area. I was told I was very fortunate to see two separate owls in a lifetime. I told my husband that even a blind pig finds an acorn now and then. It wasn't anything we did, we were just at the right place at the right time. The first sighting of the snowy owl was off in a tree. I got this picture. As we approached, he flew off across the field. You can see through the trees how large he is. If you look carefully you can see him sitting at the very top of the tree in the middle of the picture. * I have asked permission to use this photo. I have not heard so I am thinking it is ok with her. If I need to delete it, I will. Hopefully before winter is over, I will be able to get a similar picture myself. The next day we were out shopping and decided to swing by the area on the way home. I just wanted to get another glimpse of this amazing owl. If I had my choice, I would go everyday. We managed to see the owl again. I thought he looked darker but then thought the other one we saw was probably hunkered down so we couldn't see the markings. I posted the picture on a local birding site and learned that we had seen two separate birds. We saw this heavily barred snowy owl near dusk. Apparently this owl had not been spotted in this area. I feel very fortunate to live where we do. We may not have a lot of shopping opportunities or fancy restaurants, but we can see nature at its finest. With the lakes not freezing as quickly this year, many varieties of ducks, geese and even swans can be seen at any time. We have indeed had The Big Year within a few miles of our home. My Family Escaped The "Escape Room"